* Camogie had its first game of the season for Castlewellan on Tuesday of last week with the Under-14’s They entertained Ballyholland on a lovely dry but cold afternoon at the Bann Road writes Martin McClean. The Town girls were quick off the mark with Jade Hammond driving from midfield and connecting with Aisling Hawkins who was on form to score the first of her many goals. Great play from the midfielders put Ballyholland under pressure from the puck out and within ten minutes the town girls had scored another four goals and a point without reply. 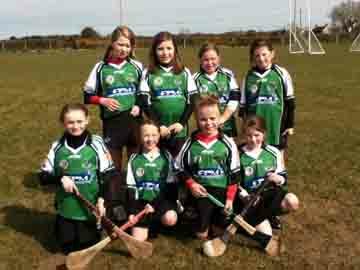 The U-12 Camogs at a tournament in Ballycran. The half forward line of Sorcha McCartan, Tara McVeigh and Shannon Valentine worked hard to put good balls into Aisling Hawkins, Oonagh Rice and Caitlin Rushe who worked hard to score some tremendous goals. The midfield duo of Jade Hammond and Eirann McVeigh covered a lot of ground and tackled hard allowing no Ballyholland girl a free shot they were ably backed up by the half back line of Laoise Keaveney Amy Barr and Emma Croskery. These young ladies tackled relentlessly and did not allow Ballyholland to settle. But player of the match Becky Toner was immense she covered ground and read the game better than any senior player. She had great back up by Emma Rice Michelle Gallagher and Eimear Rice who worked hard to keep their forwards to only two goals in the first half to compared with Castlewellan’s seven goals. It was difficult for the girls to keep the momentum going but they held on to win by two goals well done girls first match over and a win. 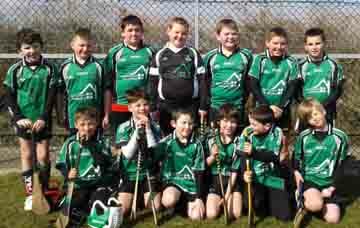 * The Under-12 Camog’s travelled to Ballycran on Saturday for their first outing of the year. The girls played well against some strong opposition in Aghaderg and Newry, but had a good win against Longstone. Well done to the girls; Molly, Aine, Kari, Holly, Eimear, Aislinn, Molly and Beth. A reminder that training is now moved to 6.30pm on Wednesday evenings in St Malachy’s Primary School. The Under-10 hurlers at Clonduff. the play particularly in the second half showed Rory and the rest of the Under 12 management team that there is the potential ahead for a successful season. Keep it up lads. A special mention to the four youngest members of the team whom made their debuts for the Under 12 team – Alex McAlinden, Dara Rodgers, Marty Steele (whom scored a great point) and Tiernan Connolly. * After the extended cold snap the sun shone at last as our Under10 hurling team headed to Clonduff for the first blitz of the year on Saturday. The boys gave a very good account of themselves with some excellent scores. They came out on top in two of their games drawing another in matches against Carryduff, Liatroim and Portaferry just losing out by a couple of points in a very closely fought encounter with Ballygalget. Well done lads and keep practicing. There will be no hurling training this week but outdoor training will be up and running next week. 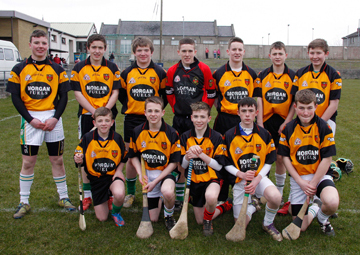 * Under-14 Hurling – First league match on Friday night away to Clonduff. Players to meet at club at 6.00pm. 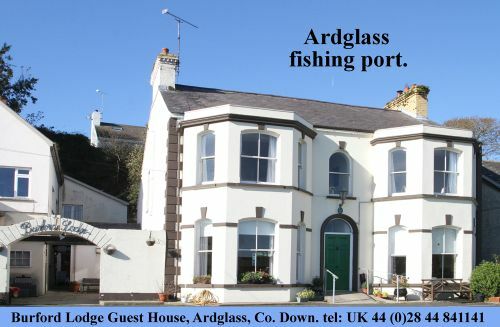 * Under-12 Hurling – First league match on Thursday night away to Carryduff. Players to be at club for 5.45pm. The Castlewellan U-16 hurlers who beat Clonduff. * There was a fantastic turnout to the Easter Tuesday Family Fun Day with a treasure trail around the lake followed by a quiz and Rounders at the club. The weather held well and a great day was had by all. There was a raffle held with all proceeds going to PIPS. Thank you to everyone whom assisted in making the day a great success. Thank you to all the parents for their support and help and mainly to all the children who made it what it was a fun day! * The new season for the Senior Footballers and Senior Hurlers kicks off this week this with the footballers at home to Loughinisland on Friday Night. The Hurlers will have played Newry Shamrocks on Monday Night with the result unknown going into press. * Activ8 – A Community in Motion! A video as part of the presentation at the Graduation Night on Saturday past typified what it was all about. 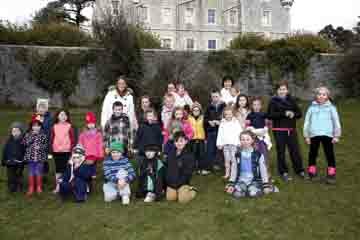 This was of a Set Dancing Class run by Sharon McCauley – Breen. What you saw was fun smiling faces, laughing, camaraderie and an odd silly hat! (Oonagh). Everyone will testify to it that is was fun even if there were a few stresses and strains along the way. Some saw the top of Slieve Donard for the first time. Some didn’t realise that in the space of one hour they could cycle 9 miles without thinking about it. Above all the making of new friends and reacquainting with some old faces. Activ8 brought together people who possibly had not met before or you only nodded at to say hello. To be honest I am probably talking about myself but I am sure there is some truth in it. We are a growing Town and it is important that we extend a welcoming hand to all that reside here. Activ8 did that. It brought in people with new skills to us. The Yoga class and thanks to Linda for making us all realise there are more muscles hidden in our bodies than we knew! Tai Chi which was expertly instructed by Richard McCabe, the skills our club coaches have that parents may not have realised. In the end there was a competitive edge to it. The final points to be won on the night were in the form of a quiz and “The Plank”. A team member had to hold a medicine ball out straight-armed for as long as they could whilst their team answered as many “who am I” quiz questions as they could before the medicine ball was dropped. Club members having fun rolling their Easter eggs. There were some valiant efforts to keep the ball from dropping and pain all around for those male members who were volunteered to be the Charles Atlas for this quiz! “The Plank” challenge was where a member of each team tried to keep the position for as long as possible. This went on for over four minutes with Anne Rooney and Michael McKibben where the last to collapse in unison. The top three participants were in reverse order Michael McKibben, Linda Rogan and out in front was Linda McCauley – Breen. The top team was Team Orange who gave it a real go to land the Top Participating Team prize. Thank you to all the participants and activity leaders. You made it the success it was. Finally thank you to Ronan King and to Lorna Cunningham for all their work to make this initiative work. Without their drive and inspiration it would not have been the success it was. There may be some random events throughout the year. Please let us know what your ideas are so we can look at continuing this initiative. * The Marie Jones play “A Night in November” will be performed on Saturday 20 April at 8.00pm in the Club Rooms. This much acclaimed play has been performed all over the world. The play is about Ken McCallister, a dole clerk who goes to the 1994 World Cup Qualifier on a night in November in Belfast as the Republic of Ireland plays Northern Ireland. Tickets are on sale from the Club at £10 each. It is anticipated that tickets will sell very quickly as this play has sold out virtually everywhere it has been shown. Can you please ensure you purchase your ticket early to avoid disappointment. * The outdoor juvenile training Under-6 to Under -10 will start week commencing 14 April 2013. A full programme will be published this week. Please watch the website for the details. * Under-12 girls training continues in St Malachy’s Primary School on Monday nights at 6.15pm to 7.15pm. Under 10 and under 8 age groups. * Under-8, Under-10 and Under 12 Camogie training continues every Wednesday in St. Malachy’s Primary School from 6.15pm – 7.15pm. Please wear suitable foot wear which will not mark the floor. * The Under-14 footballers will train at the Bann Road on Wednesday night at 6.30pm. This will depend on the weather and the conditions also. * Hurling outdoors will continue on Thursdays at the Bann Road. Under-8 – Primary 3/4 and Under-10 – primary 5/6 at 6.00pm. Under-14 hurling will begin at 5.45pm on Friday’s at the Bann Road. Again weather and conditions permitting. * In this week’s lotto there were no jackpot winners and two £20 winners. They were Patsy Burns and Geraldine McKibben. The numbers were 10, 13, 14 and 16. Next week’s jackpot is £3600.